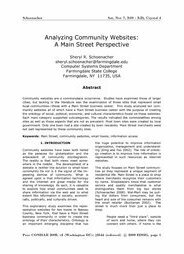 Recommended Citation: Schoenacher, S R. Analyzing Community Websites: A Main Street Perspective. In The Proceedings of the Conference on Information Systems Applied Research 2009, v 2 (Washington DC): §3544. ISSN: 0000-0000. Community websites are a commonplace occurrence. Studies have examined those of larger cities, but lacking in the literature was the examination of those sites that represent small local communities—those with a Main Street business center. This study analyzed ten community websites all of which have a Main Street business center with the purpose of creating the ontology of social, political, economic, and cultural characteristics found on these websites. Each main category supported subcategories. The results indicated the commonalities among sites as well as those aspects that are not as prevalent. Most town sites were created by local government. Only one town had a site created by town residents. Main Street merchants were not well represented by these community sites.